They hear the most silent of footsteps. They are faster than anything you've ever seen. And They won't stop chasing you...until you are dead. Amy is watching TV when it happens, when the world is attacked by Them. These vile creatures are rapidly devouring mankind. Most of the population is overtaken, but Amy manages to escape—and even rescue “Baby,” a toddler left behind in the chaos. Marooned in Amy’s house, the girls do everything they can to survive—and avoid Them at all costs. After years of hiding, they are miraculously rescued and taken to New Hope, a colony of survivors living in a former government research compound. While at first the colony seems like a dream with plenty of food, safety, and shelter, New Hope slowly reveals that it is far from ideal. And Amy soon realizes that unless things change, she’ll lose Baby—and much more. 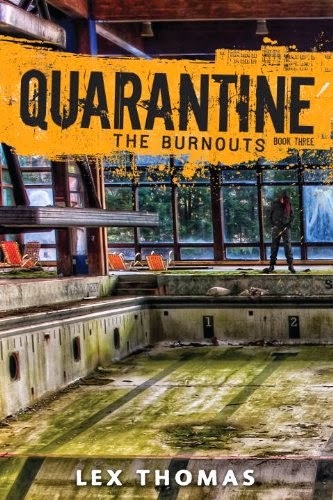 Rebellious, courageous, and tender, this unforgettable duo will have you on the edge of your seat as you tear through the pulse-pounding narrow escapes and horrifying twists of fate in this thrilling debut from author Demitria Lunetta. “This is how I think of time: the past is Before, and the present is the After. 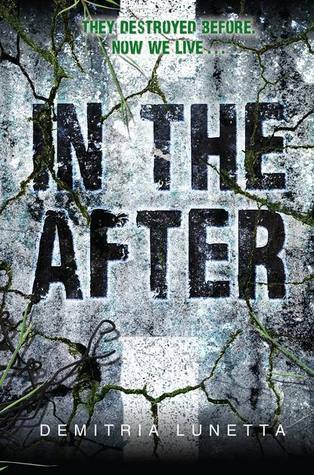 In The After was one of my most anticipated releases for 2013. So of course when I was given the chance to read it early I couldn't resist. Thankfully In The After not only met but actually exceeded my expectations! Amy and Baby haven't spoken in years. To speak is to die.The only noise comes from Them, the zombie like creatures who've taken over the planet. Amy and Baby have survived due in part to Amy's father being Eco-Friendly. If it wasn't for the solar panels powering Amy's electric fence Amy and Baby might very well be dead. After coming across another survivor, Amy and Baby are betrayed. Now reunited with people for the first time in years, Amy and Baby must adapt to a new world order run under the thumb of someone from Before and a Doctor whose intentions aren't as genuine as they appear. While I love this book it is the incredible characters who sell the story. Amy is 14 years old when the "Aliens" arrive. She's a typical teenager who grows up hard and fast. Amy is left all alone in The After until the day she stumbles upon Baby in an abandoned store eating spoiled grapes. She knows taking the toddler with her is dangerous but decides to save her anyway. Much to Amy's surprise the toddler knows how to keep quiet, knows that noise attracts Them. I love that Amy is resourceful enough to know that Toddlers will pick up things quickly so naturally sign language becomes the safest way they can communicate. Don't worry though it is quite easy to follow whom is "speaking" in the scene. While the first half of the book focuses mostly on Amy and Baby's survival in The After, the second half has Amy and Baby arriving in a survivor city called, New Hope. After living almost 4 years in total silence the noise is almost deafening. Every instinct Amy and Baby have is to be quiet, be safe but here people talk, they laugh. It's loud, like Before. However, New Hope is filled with people, with life and that is hard to resist even for two battle hardened survivors like Amy and Baby. Now I realize this book needed a twist and we definitely get one with the introduction of New Hope, however I was a bit bummed how predictable corrupt New Hope actually ended up being. All I could think about was how closely it resembled the fictional town Woodbury from the series The Walking Dead. Just slap an eye patch on Dr. Reynold's and call him the Governor already. I did however like that the citizens weren't entirely clueless. However, like most other books none were willing to rock the boat out of fear. My only other disappointment with In The After was the introduction of The Ward. I really thought maybe it would end up being that Amy was in an institution all along and while the Doctors thought she was crazy she was actually prophesying The After. Sadly nope it just ended up being a place where bad citizens go to be "treated". I didn't like how the story jumped from one to the other. It did sort of kill the flow of the story and was one of the only real low points of the whole book. Thankfully by the end the pacing had picked right back up and I was certainly left excited for the next book whenever it's released. In The After might not be the most unique book I've ever read but once you throw in two very strong mc's, a swoonworthy guy and actually scary monsters you have what I'm calling one of the best Science Fiction books of the year. I highly suggest picking up In The After and giving it a go. If you only buy one Science Fiction book this year make it this one! With that being said, I will be rating In The After by Demitria Lunetta ★★★★. It's..... complicated Jen. Trust me though the book is worth the read! Great review! Anyone who is out to buy English books online, must add this book in the list.